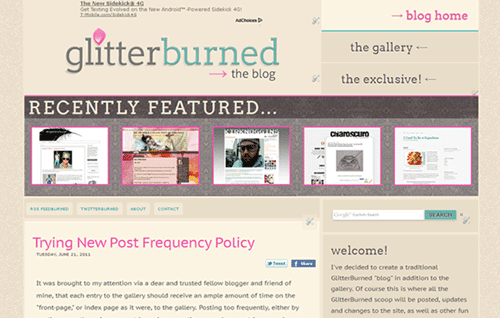 I have been playing around with templates on Blogger for a little while now (Blogger templates specifically since 2009, designing for the web altogether since 1996) but I must admit I have quite enjoyed creating the GlitterBurned Gallery, as well as it's new "companion blog," the GlitterBurned Blog. In creating these two blogs, I experienced a couple "firsts," of my Blogger blogging experiences. One such Blogger first, was in creating the gallery. This was my first design of a "gallery" style on Blogger, consisting of multiple posts positioned beside one another on the main page of the design, each dominated by an image/photograph. In this case that dominating image, would be a screen capture of the blog which is the subject of the particular post. Another first, in a long time at least, is the "liquid" design style I have used GlitterBurned's new blog. Now, mind you, this is far from the first liquid layout I have ever created. No, no, I most certainly created my first liquid layout before the year 2000. Nonetheless, it has been years to be honest, years since I have created a new "liquid" layout prior to this. And by "liquid" what I am referring to is the lack of a fixed width to this layout, (save for the minimum width!) and the design's ability to slim and strech according to the width of the screen. Doing these "firsts," brings to mind two questions. Why havent I created a liquid layout for so long? I'll answer them both. One factor in my chosing to create fixed width layouts for so long is, honestly, I didn't have to. Coding is something that I actually enjoy, thus I do keep abrest of the latest and newest techniques, changes, and so on. In the same token, however; I also keep abrest of issues that pertain to my niche of blogging. And of course, being master of my domain, I am at liberty to make executive decisions regarding what my designs need to support. A screen capture of the new GlitterBurned Blog, and it's "liquid" layout. Let me explain my motives a little further. I work on an archaic computer with an equally archaic and dismal monitor, and use Windows XP. Not the latest, not by far. There is little past browser shots in my arsenal for cross browser testing. That said, I knew I could design best for PC users, more specifically, Windows users. If my computer and browser could do it, the majority of fellow Windows users with a relatively recent browser, would have similar capabilities, and likewise an additional (growing) number of Window's users, would have similar capabilities and then some as well. Thus a good number of folks would get an experience close to what I intended them to. How does this relate to my reasonings behind creating liquid layouts or not? It's with the rational that my computer is sub-standard with an equally second rate quality of web experiences; a fixed width layout befitting a reslution of 1024px or larger was not so much to ask. Excluding of course the unending assortment of new mobile and hand-held gadgets with to-die-for-web-capabilities, I felt comfortable requiring a minimum of 1024px viewable width for my designs to display correctly, because excluding the aforementioned shiney handheld toys, existing machines uncapable of this width most likely are incapable of an experience anywhere near to the one I intend regardless. They are valued as highly as are all those I design for, but alas, there is nothing more I could do for them. Another major factor in my fixed width fixation for the past several years, I don't have a widescreen. I don't get to appreciate the aesthetic of liquid layouts too often.